In 1864, Americus, Ga., was short on buttons and bandages but long on community and family values. Just 10 miles away, however, sat the notorious Andersonville Prison. 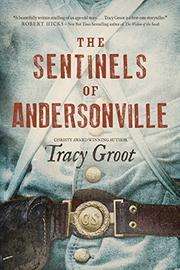 All delicate bones and huge blue eyes, Violet Stiles is the lodestar for Dance Pickett, a gimlet-eyed young man stationed as an Andersonville sentry. Armed with little more than whiskey and determination, Dr. Stiles, Violet’s father, daily tries to cure the incurable. He and Dance strive to keep the womenfolk—indeed, the entire community of Americus—blissfully ignorant of the unspeakable conditions at the prison. Yet Violet’s desire to do good sets her on a collision course with the truth. Looking for a package of seashells, Violet impetuously sets off to find her father at the prison hospital. Dance sees her in the distance and tries to stop her before she can witness any of the horrors. He’s too late. Violet has seen the broken Union soldiers. Perhaps worse, she’s overheard a conversation between Emery Jones and Lewis Gann. While escorting Lewis (the lone survivor of the 12th Pennsylvania militia) to the prison, Emery (a witty Confederate from Alabama) unexpectedly finds a friend. As they frankly discuss the war, Violet realizes that the Union soldiers are not the vermin she’s been led to believe they are. Distraught over the conditions at Andersonville, as well as the complacency in Americus, Violet, Dance, Emery and Dr. Stiles found the Friends of Andersonville. Intended to open the eyes of Southern citizens to the truth and to improve conditions for the soldiers held at Andersonville, the group instead challenges everyone’s moral fortitude. When mercy is seen as treason, even the heroes are endangered. Christy–award winning novelist Groot (Flame of Resistance, 2012, etc.) unflinchingly examines the consequences of becoming a good Samaritan in this richly detailed, engrossing historical fiction.